WE’RE OPEN! The trails in the banana belt of Vermont are ready to ride/hike/run! Lots of BATS folks were out this warm spring weekend enjoying the trails on Mount Anthony. We’ve cleaned up most of the trails, done some leaf blowing, but still have a few blowdowns to clear. The mountain is surprisingly dry, but there are some muddy spots to steer clear of down low; the carriage trail is still pretty wet. As many of you know, Southern Vermont College (SVC) is closing in a few weeks. This obviously has an impact on the BATS trails, and we will be working to try and keep public access open. In the meantime please respect the college and do not plan on parking at the Everett Mansion lot; security has been blocking off the access road for the privacy of the students and staff. You can still access all of the trails from Southwestern Vermont Medical Center along Monument Ave or the Camelot Village/Garlic Fest field. Refer to our trail map for trailhead access point at www.batsvt.org/trails or find us on TrailFinder.Info’s VT Trail database. As we go through these difficult times as a community, we ask for your support. 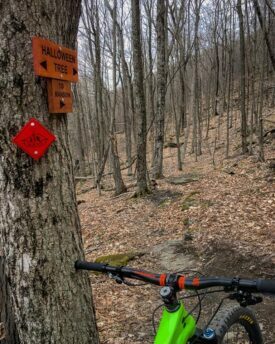 Reach out and volunteer, help out on trail work days, and join as a BATS member through the Vermont Mountain Bike Association.